To Broaden Appeal, Afghan Candidates Make Surprising Choices : Parallels The three leading candidates in Afghanistan's presidential election are all urbane, Westernized men who usually wear suits. Yet their running mates range from notorious warlords to a woman. As Afghans prepare to choose a new president Saturday, it's hard not to notice a striking contradiction. The three leading candidates are all urbane, Westernized men inclined to wear suits and ties in public. And yet, as they crisscross this impoverished, traditional country, they've all had to remake themselves to some degree, in their dress, their speech and even in the surprising choices they've made for vice presidential running mates, who range from notorious warlords to a woman. Dr. Abdullah Abdullah is a former ophthalmologist and foreign minister who finished second in the 2009 race. He made his name with the Northern Alliance, a group made up mostly of ethnic Tajiks who fought against the Taliban, who are largely ethnic Pashtuns with strongholds in the south. 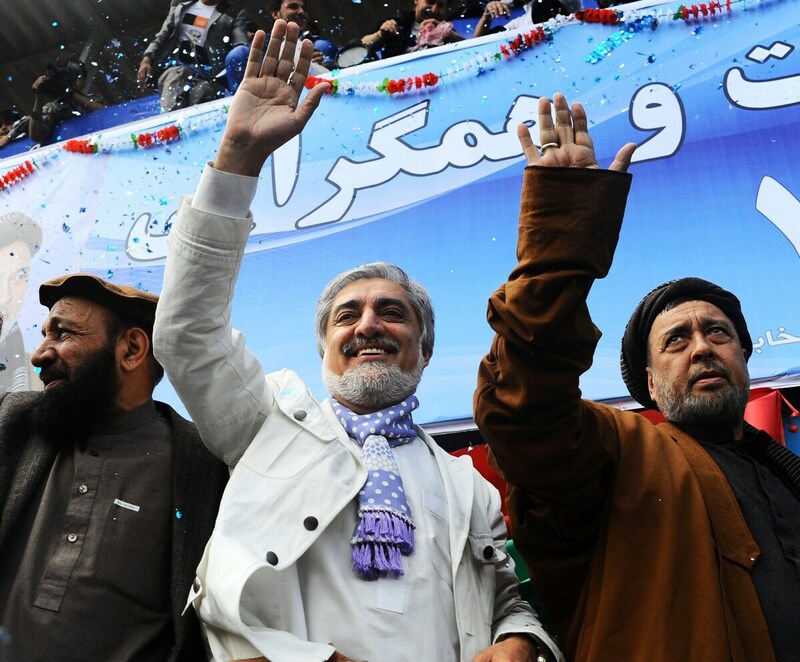 Afghan presidential candidate Abdullah Abdullah (center) and his vice presidential candidates Mohammed Mohaqiq (right) and Mohammad Khan (left) wave to their supporters at a rally in the northwestern city of Herat on Tuesday. But on a recent day, Abdullah was campaigning at a soccer stadium in Kandahar, the largest city in the south, and the crowd was a sea of turbans under a hot sun. The crowd waved placards and Afghan flags, and shouted, "Long live Dr. Abdullah. We're not going to give our votes to anybody but Dr. Abdullah." 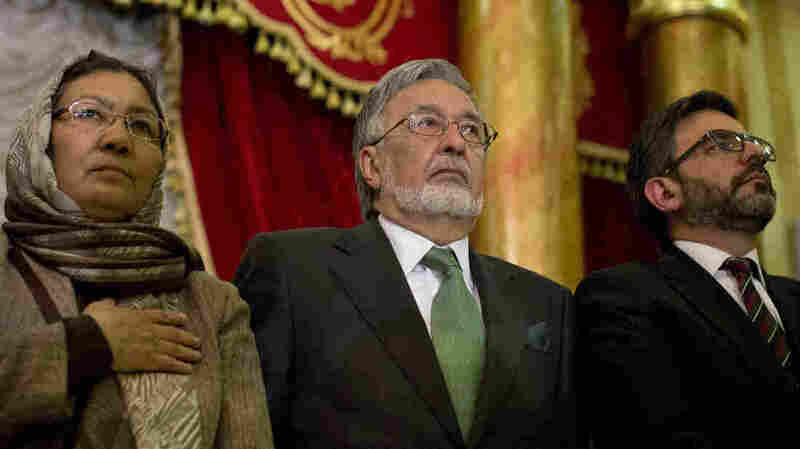 In an attempt to broaden his appeal, Abdullah's first vice presidential running mate is Eng Mohammed Khan, a leading figure in Hezb-i-Islami, or the Islamic Party, a group that battled the Soviets in the 1980s and the Americans since the fall of the Taliban. Khan belongs to the party's political wing, not its militant faction. Although technically separate entities, they share the same fundamentalist Islamist ideology. Then there's Dr. Zalmay Rassoul, a former foreign minister and a close confidant of President Hamid Karzai, who is barred from running for another term. Rassoul, by the way, received his medical degree from the Paris Medical School in France. He was campaigning recently in the cool, gray highlands of Bamiyan, in central Afghanistan, as a boys choir celebrated him with a special song praising the candidate. One speaker urged the crowd to roar loud enough "to shake the dust off the Buddhas." Just across the valley are the outlines of where the giant Buddhas of Bamiyan had stood for hundreds of years, carved into a hillside, until the Taliban destroyed them in 2001. Rassoul has taken the unprecedented step of selecting a woman, Habiba Sarobi, as one of his two vice presidential running mates in hopes she will attract female voters, who make up roughly a third of the electorate. But it's not clear if women will vote in large numbers and if they will make their own choice, or follow the wishes of their husbands. 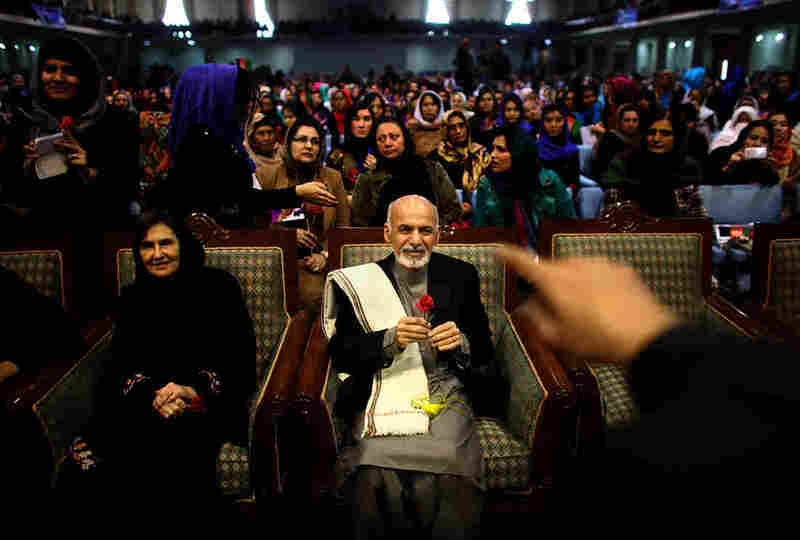 The other leading candidate, Ashraf Ghani, who has a doctorate in cultural anthropology from Colombia University and spent 10 years with the World Bank, is also reaching out to women. "As long as there's no money in an Afghan woman's pocket, her rights under Sharia law [Islamic law] won't be guaranteed," Ghani said in the final presidential debate, which was broadcast on Afghan television. "If a woman is poor, it affects the next five generations. If a woman is educated, it also affects the next five generations." The race is considered wide open. Polls in Afghanistan do not have the same degree of accuracy as in the West, but they show Ghani to be a few points ahead. That's quite an improvement from his showing in the last presidential race in 2009 when he was an also-ran with just 3 percent of the vote. This time around, Ghani is something of a new man. He has a beard, white and closely trimmed. And he will often exchange his tie for a turban, and his suit for a traditional shalwar kameez, the loose-fitting tunic worn by most Afghan men. At his home in Kabul, there are blast walls and armed guards. Inside, we sat down in a graceful room, adorned with intricately carved wood and covered in Afghan carpets. Ghani was in his World Bank office in Washington on Sept. 11, 2001, when one of the hijacked airplanes slammed into the Pentagon, just a few miles away, shutting down the city's transportation system. "My house was eight miles away, and I couldn't walk eight miles," he said. "So I started writing the plan for the reconstruction of Afghanistan that day." Ghani left Washington and returned to Afghanistan in December 2001 after more than two decades in the West. Soon after, President Hamid Karzai named him finance minister. At the time, Afghanistan's currency had lost so much of its value that people needed a sackful of notes just to buy flour and eggs. The International Monetary Fund urged him to temporarily adopt the U.S. dollar as currency and then return to Afghan currency at a later date — something that would have been a massive undertaking. Ghani took a simpler route and went straight to the shops and streets of the traditional money changers. They swapped out new bills for the old in just weeks. It's this practical, problem-solving approach that has attracted voters to Ghani — which made it all the more surprising that he chose as his running mate Rashid Dostum, a former warlord known for his ruthlessness in Afghan's civil war. Ghani once called him a "murderer." But Dostum has a strong following of his own and is the most prominent figure among the ethnic Uzbeks, who make up a significant voting bloc. "It's not just the voting bloc. The issue is national unity," Ghani said. "If we are going to move forward, we cannot keep excluding people who have a social base in this country. If we treat them like a problem, they become problems." Asked why he seems to be a more effective candidate in this election, Ghani replied, "What I learned was to speak the language of my country. Get out of my technocratic skin and speak like my grandfather, who was an influential man, a general, but really a man of the people." "I'm re-rooted firmly in the soil of this country," he added. "Nobody can look and say, 'Oh, there goes a Johns Hopkins professor.' What they say is, 'There goes a man of the people.' "